Snow in Tahoe Already: How Weird is That? 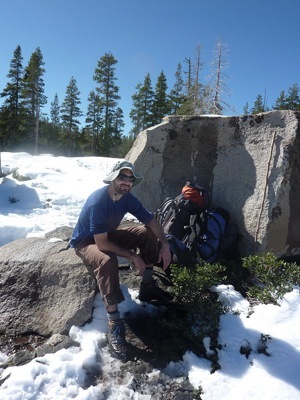 For months now, I had reserved the second weekend in October for my annual grand finale “summertime” backpacking trip. Culminating an unusually short warm season, this was to be the ceremonial final alpine lake swim, the last mosquito bloodletting until well after next year’s thaw. Which is why, as my partner and I proceeded to pitch our tent in about 10 inches of snow last Friday evening, I couldn’t help but feel I’d been had. Last week’s storm, which swept across the northern half of California early Wednesday, dumped up to a foot of snow in the Sierra’s high peaks, with accumulation as low as 5,000 feet. According to the Central Sierra Snow Lab, this is the first snowstorm in 96 days – since July 1 – marking the shortest duration between storms in the Sierra since 1969. Don’t get me wrong. It was absolutely gorgeous. 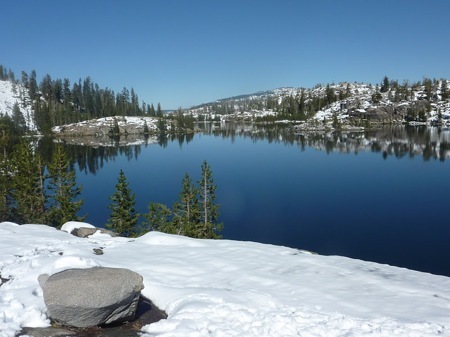 We hiked – or more accurately, trudged – a few miles into the Grouse Lakes Area, a basin in Tahoe National Forest at just over 6,000 feet, where ridges of polished granite cascade into a necklace of shimmering lakes. Add a blanket of white covering the forest duff, dotted with majestic cedars and pines, and the scene was downright breathtaking. Not one mosquito, either. And even though the conditions for us over the weekend were gorgeous, with cloudless blue skies and daytime highs reaching into the low seventies, there was still plenty of snow on our way out Sunday afternoon. Despite the earlier forecasts of blustery conditions in the area, we assumed (with little rationale aside from denial), any frigid weather this time of year would steer clear of anything below, say 7,000 feet. Evidently, not so. “October is like a half-and-half month; there are dry Octobers and wet Octobers,” said Johnnie Powell, a weather forecaster at the National Weather Service’s Sacramento office. “This was a December-like storm. It’s not rare but it isn’t normal, either.” And by next weekend, he added, after a warm rain system followed by several days of dry weather reaching into the 70’s, most of the wintry evidence will be gone. And oh, just for the record: as promised, I did take that final swim, a straight dive into a beautiful snow-encrusted lake, and a very swift exit out. I don’t regret it, but I might not recommend it. Matthew Green is the education outreach specialist for KQED News.